Chocolate and beetroot? I had read before that beetroot is supposed to make a chocolate cake great. I haven’t tried that yet, but thought I would give it a shot. I mean, it does sound weird, I give you that, but if it really is as moist and delicious as people have claimed, I wanted to give it a go. So I finally got around to making a very chocolaty bundt cake and this time I wanted to see whether beetroot really could work its magic on it. So I did a little research and then decided to go with the recipe posted by Marc from the blog Bake to the roots. As always I changed the recipe a bit to my liking. For example, I added molasses as I love the caramel flavor of it. Also, I made a chocolate glaze and decided to make another layer of caramel, because, why not? And when I finally tried my first piece, I have to say, yes, beetroot really makes it super moist and delish. I hate dry cakes, especially if they are made as a bundt cake. So this was perfect for me. 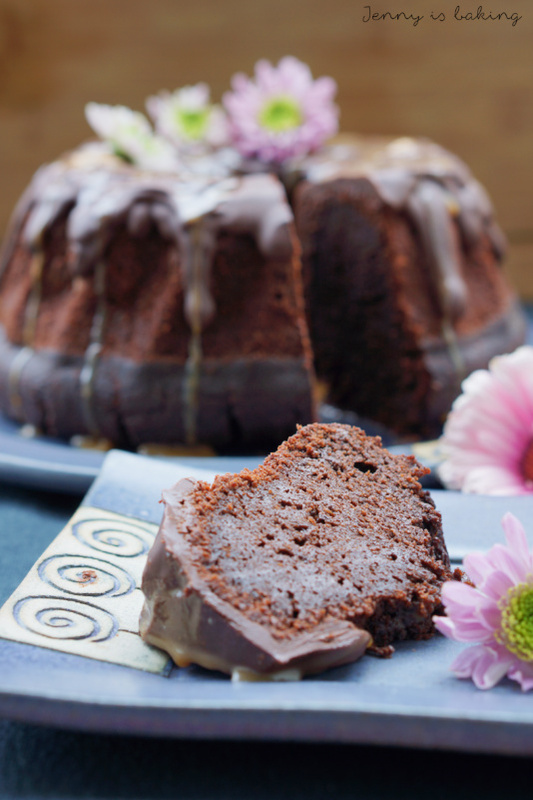 So may I introduce you to a super moist and chocolaty bundt cake with a hint of caramel and some chocolate glaze! 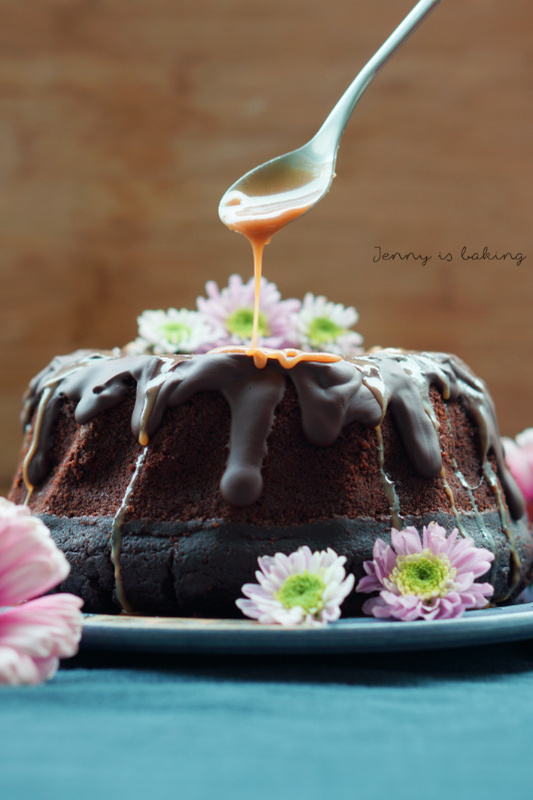 For the chocolate bundt cake, grease a bundt cake pan with 22cm in diameter and flour it. Preheat oven to 180 degrees Celsius. In a large bowl, puree beetroot, add the oil, molasses and vanilla extract and mix. Add eggs, one at a time. Add all other ingredients and mix until combined, don’t overmix. Pour into prepared pan and bake for one hour. Inserted toothpick should come out clean. If cake still needs baking, cover with aluminum foil. Mine needed one hour and 15min. Let cool for ten minutes before taking out of the form. Meanwhile prepare chocolate glaze. Melt chocolate and butter on low heat and pour over cake. For the caramel sauce put sugar and water into a frying pan and stir on medium low until mixture becomes golden. Take off heat, add heavy cream and stir for 30 seconds. Put pan back on the stove and add butter, stir until melted. Let cool at room temperature. Shortly before serving drizzle with caramel sauce. 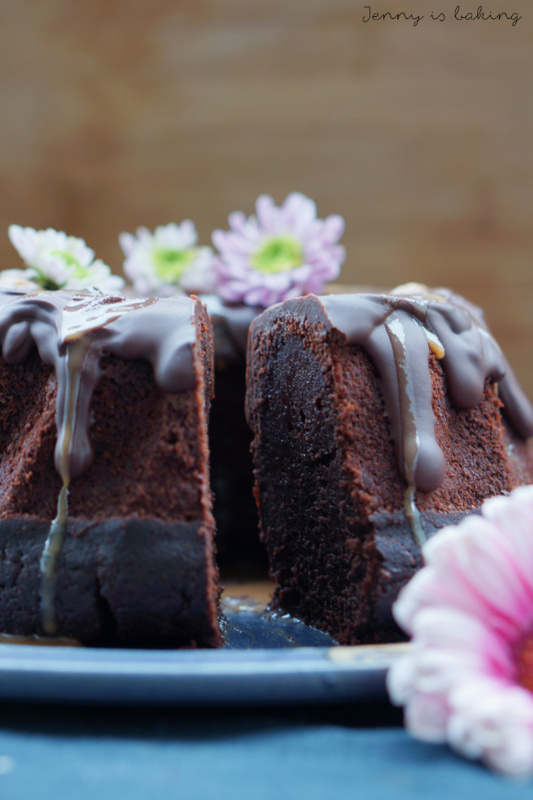 You can also bake this cake in a 26cm springform or 30cm bread pan form. oh wie schön! Ein süßes Rezept mit roter Bete! Damit hätte ich gar nicht gerechnet, find ich aber ne richtig super Idee! Vor allem, weil er auch noch so unverschämt saftig aussieht! Da vergesse ich glatt den Plätzchenteller neben mir! Dankeschön auch fürs Mitmachen beim Event! Wow, das klingt ja super. 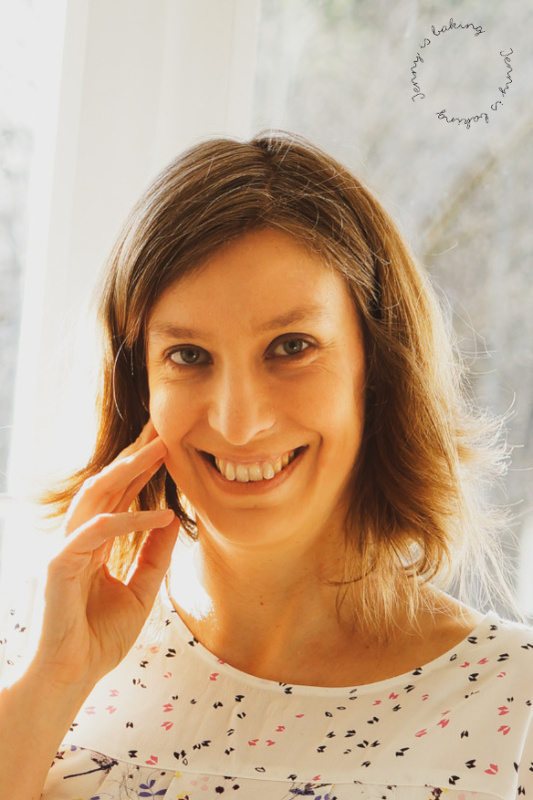 Ich komme über das Blog-Event bei Zorra zu Deinem Rezept und finde, es liest sich äußerst verführerisch! Ich kann den Kuchen nur empfehlen! 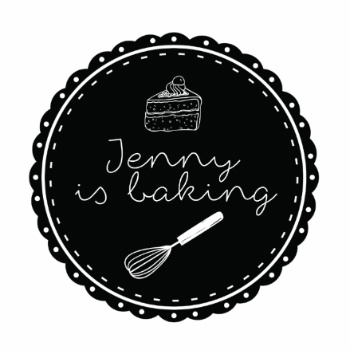 Magst du vielleicht ein Foto an info at jennyisbaking punkt com schicken? Ich bin so neugierig!